On our way back from Durango we visited Honeyville House just 10 miles north of Durango on Hwy 550. As you might expect they have everything honey: raw honey, comb honey, whipped honey, jams and jellies made with honey, sauces sweetened with honey, and more. And whiskey. With honey. Confused? That makes two of us. 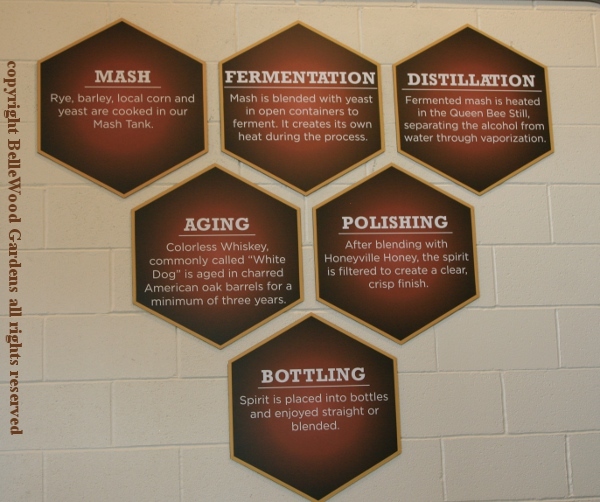 Honey House is distilling bourbon, rum, then adding honey. 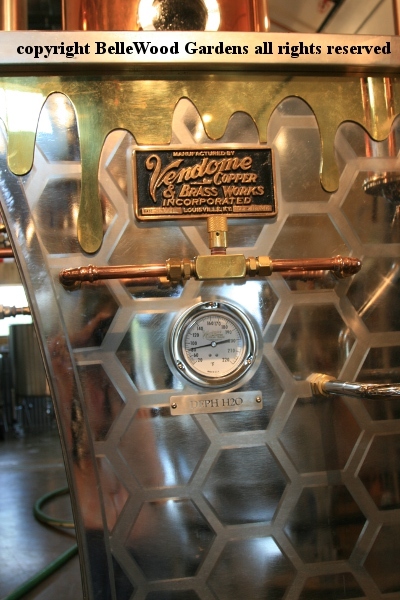 Mead, which is fermented honey, is distilled for their vodka. Come, let's take a look in the distillery, which I was shown around. But first, remember that whisky is Scotch while whiskey is bourbon. makes up most of the mash bill, with some rye and malted barley. honeycomb embellishment on the exterior. 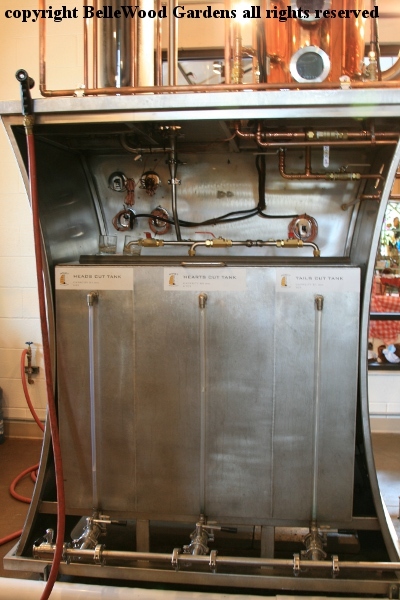 A batch system is best for whiskey, rum, and vodka. 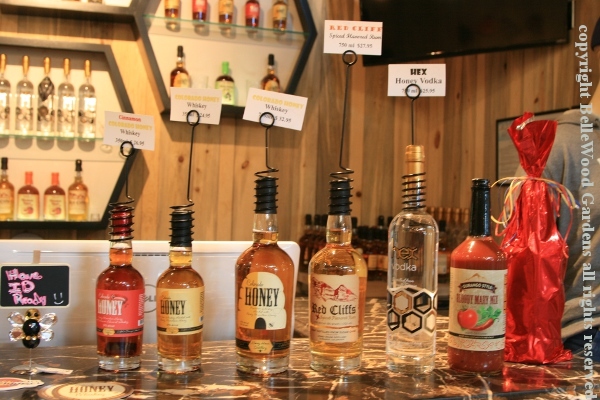 Also brandy, and Honey House Distillery is planning to make brandy using Palisade peaches. An advantage of a batch system is the ability to run different types of products, and small batch products. A disadvantage is that the final product is based on the operator making consistent heads, hearts and tails cuts. which is necessary in batch fermentation. To explain in more detail: In a process is called rectification the distillate is divided in three parts to allow the elimination of the unpleasant and unwanted substances by removing the heads and tails of the distillate. It is the skilled distiller and their ability to establish when the head of the distillate ends and the heart, rich in ethyl alcohol and aromatic substances, all the substances of quality, starts to come out. The distiller must also recognise the end of the heart and the start of the tail, which contains unpleasant fatty and oily substances. for three or more years. After which the bourbon is blended with honey. Next, it is filtered, then bottled. 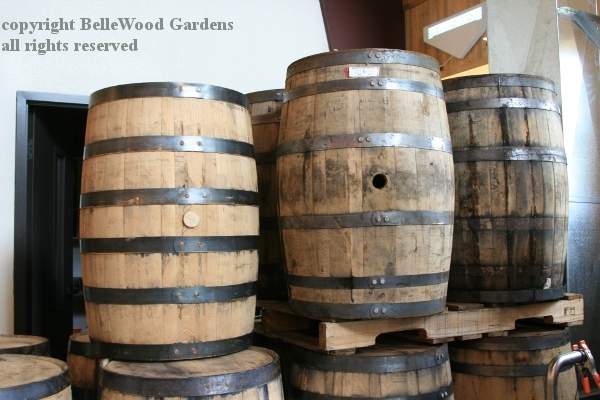 The casks can be re-used to age rum. Here's the vodka or fractionating column, which is a vertical, cylindrical vessel used to increase the degree of separation of liquid mixtures by distillation or extraction. I think the column off to the right is a condenser. 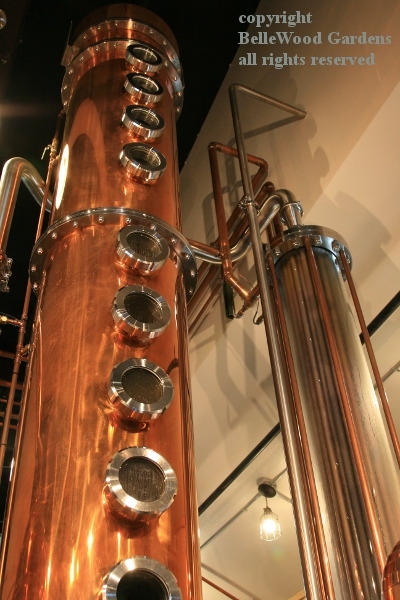 The column is used only for vodka and cuts are still made for a final batch of vodka. Additionally, Honey House Distillery makes their vodka by actually fermenting a batch of honey then distilling it - which is similar to mead. However there is a higher alcohol content. The vodka is therefore different from the bourbon and rum in where and how the honey is incorporated. A continuous system has a vertical column, with 15 to 20 plates, heated with live steam. Alcohol is boiled over as vapor and condensed into distillate, which is produced consistently with no need to make heads, hearts, and tails cuts. Excellent - because of the ability to distill with great consistency - for bourbon, whiskey, and rum, products that go into the barrel to age. Also great when paired with a batch still to make vodka and gin. 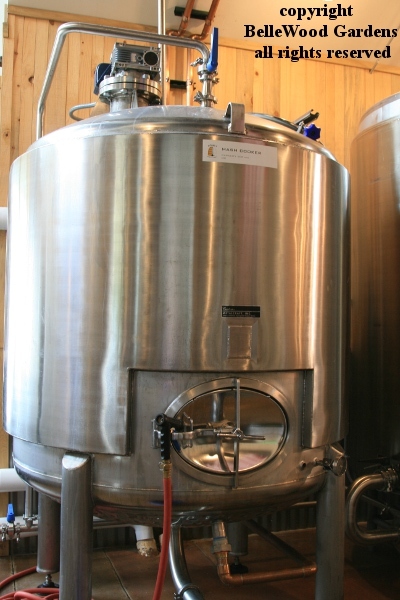 There are disadvantages: it requires 30 feet of ceiling height, it is not well suited for small batches, it is more difficult to run when first starting up, and requires more skill and knowledge. Intrigued? Yes. But once the whiskey or rum is distilled, aged, blended with honey, filtered, bottled, and sold to the customers, what can they do with it. Honeyville describes their Colorado Honey as a blend of premium bourbon whiskey and Rocky Mountain honey from Colorado and Wyoming. They say it can be enjoyed straight, on the rocks, or mixed for unique cocktails. A traditional cold remedy is a hot toddy, with whiskey, honey, lemon, and hot water. One summertime honey whiskey cocktail is a riff on this, with honey whiskey, some freshly squeezed lemon juice and a splash of water served over ice and garnished with sliced lemon. Lemon provides a balance for the honey's (not overwhelming) sweetness. At the Dalton Ranch Golf Club I had a very nice Malbec. A bottle's worth together with some honey whiskey and a sliced orange (half, if the orange is large) and refrigerated overnight you have a pleasantly drinkable sangria. Try it, decide if you like it, and look for adaptations to . . . Bee's Knees, Whiskey Sour, Long Island Iced Tea . . . or invent a cocktail of your own.